The first question that people ask about any fossil vertebrate is 'what did it do?' Just how did the heavily armoured Devonian fishes manage to swim? Why did some mammal-like reptiles have massively thick skull roofs? What did Stegosaurus use its back plates for? Why did sabre-toothed cats have such massive fangs? These are all questions of functional morphology, the interpretation of function from morphology, the shape and form of an animal. The main assumption behind this approach is that structures are adapted in some way, that they have evolved to be reasonably efficient at doing something. So, an elephant's trunk has evolved to act as a grasping and sucking organ to allow the huge animal to reach the ground, and to gather food and drink. A long neck has evolved in giraffes so they can feed higher in trees than any other living mammal (and reach the ground to drink). Tunas have more red muscle than most other fishes so they can swim faster and further. The bones of a fossil skeleton can provide a great deal of information about function. The bones themselves show directly how much movement was possible at a particular joint, and this can be critical in trying to reconstruct how particular vertebrates could swim or fly. The maximum amount of rotation and hinging at each joint can be assessed because this depends on the shapes of the ends of the limb bones. There may be muscle scars on the surface of the bone, and particular knobs and ridges (processes), that show where the muscles attached, and how big they were. Muscle size is an indicator of strength, and this kind of observation can show how an animal moved. There are two main approaches to the study offunc-tional morphology (Figure 2.8). First is comparison with living animals. If the fossil form belongs to a modern group, perhaps a Miocene elephant, then this exercise can be very useful, if applied with care. The palaeontologist can compare the bones of the fossil species with those of a modern elephant to work out the size and weight of the fossil, whether it had a trunk or not, how it used its teeth, and how fast it could move. If there are no close living relatives, or if the living relatives are very different from the fossil species, then there may be problems. The extant phylogenetic bracket (EPB, Witmer, 1997) may help. 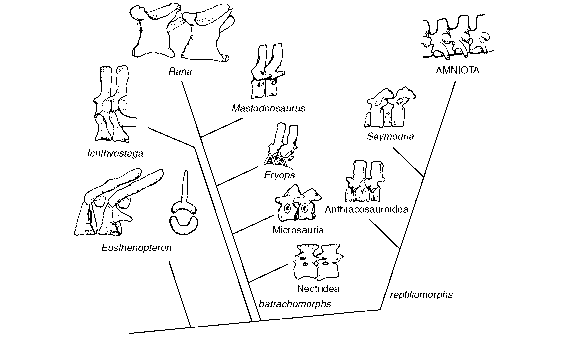 The concept of the EPB is simple: even if a fossil form is distant from living forms, it will be bracketed in the phylogenetic tree by some living organisms. So, it would be wrong to interpret all dinosaurs in terms of their descendants, the birds, but, in the evolutionary scheme of things, dinosaurs are bracketed by birds and crocodiles. So, any character shared by both crocodiles and birds, such as air sacs in the head region, is likely to have been present in dinosaurs, even if air sacs have never been seen in a fossil. In comparing the Eocene elephant with modern elephants the EPB highlights one problem: it cannot be assumed that the Eocene elephants had all the characters of modern forms, as some characters may have been acquired between the Eocene and the present day. In some cases, of course, the fossil form is entirely different from modern animals and has no obvious relatives that are close enough phylogenetically. An example is the group of giant marine reptiles called pliosaurs (see p. 245) that lived in Jurassic and Cretaceous seas. These animals (Figure 2.8(a)) had massive heads and short necks, and long wing-like paddles. They do not have any close living relatives, but comparison with modern marine predators suggests that pliosaurs fed on other, smaller, marine reptiles, as well as fishes and ammonites,coiled swimming molluscs. 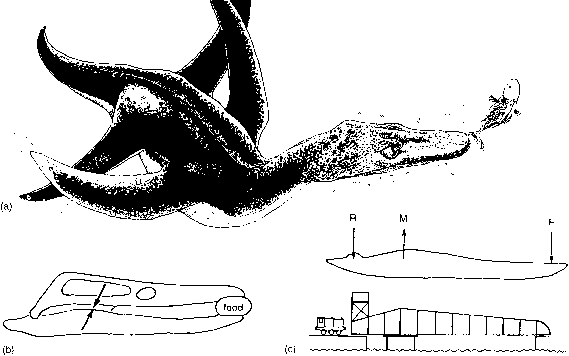 The pliosaur skull may be interpreted by means of the second approach in functional morphology, which is to use mechanical models (Taylor, 1992). The jaw (Figure 2.8(b)) may be compared to a lever, and calculations may be made of the forces acting to close the jaw. Changes in the shapes of jaws in ancient herbivores and carnivores can often then be understood in terms of adaptations to achieve a stronger bite at the front of the mouth, or perhaps to evolve an efficient grinding and chewing system further back in the mouth. In pliosaurs, the jaw was designed to clamp shut with huge force, and to prevent the prey struggling free. The shape of the pliosaur jaw, with an elevated coro-noid eminence near one end has been compared to an asymmetrical swing bridge (Figure 2.8(c)) that is loaded by its own weight when it is open. Similarly, the layout of bones in the skull may be interpreted in terms of the stresses acting in different directions in a hypothetical model of a box with holes. The skull and jaw structure suggests that pliosaurs used their heads in powerful twisting movements to tear off flesh (Taylor, 1992). These kinds of biomechanical studies are much enhanced by the application of simple mathematical models. The weakness of these kinds of functional studies is that they are not scientific, even though they may be quantifiable. Searching for plausible explanations may generally reveal the truth, but there is no hypothesis-testing. Ultimately, of course, when dealing with extinct organisms, it is hard to know how to devise directly testable hypotheses, because we will never know what a particular Devonian fish or pliosaur actually did. Conclusions in functional morphology may be checked by the use of information from the context of a fossil. Pliosaurs, for example, are always found in marine sediments, associated with other smaller marine reptiles and fishes. Their skeletons often lie in deep-sea sediments that apparently lacked oxygen, so the carcasses clearly fell from higher, oxygenated, waters. This confirms that pliosaurs were free-swimming predators, and the associated fossils show some possible elements of their diet. Some skeletons preserve remnants of stomach contents, and fossil dung, coprolites, and supposed plesiosaur vomit (? vomitite) are also known. There are even some specimens of plesiosaur bones bearing tooth marks that precisely match those of some pliosaurs.